Make ice cream by shaking cream next to salted ice to freeze it. Each student: open a small baggie and add 2 tablespoons whipping cream, 0.5 teaspoons sugar and 2 or 3 drops of vanilla essence. Seal. Double bag the mixture by fitting this bag neatly inside a second baggie. Hang the baggies down the inside of a large container (500/650 g/ml) and fold the ziplock top over to the outside of the container. The bottom of the baggies should be hanging near the bottom of the inside of the container. Two students can hang their bags on each side of the same container. 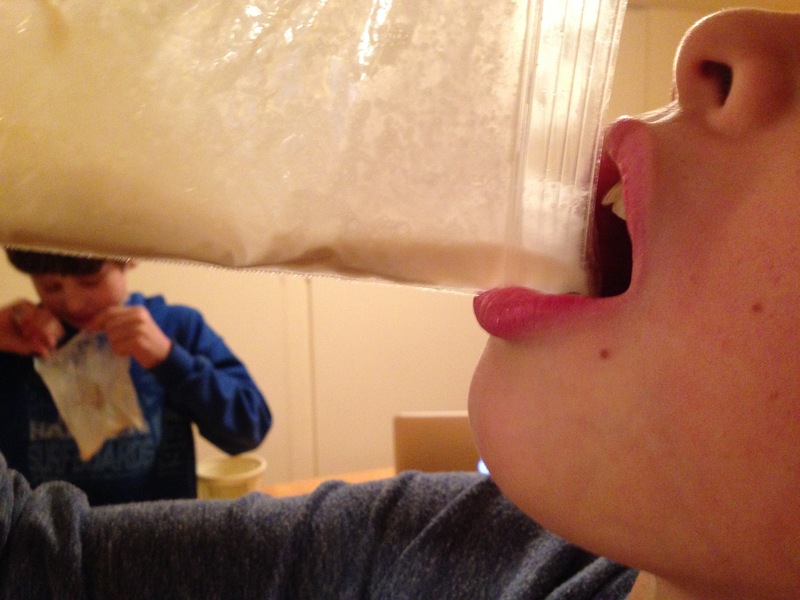 Each pair of students: add 2 tablespoons of salt and about 10 ice cubes to a the container. The container should be about 2/3 full. Snap the lid on the container over the top of the baggie. 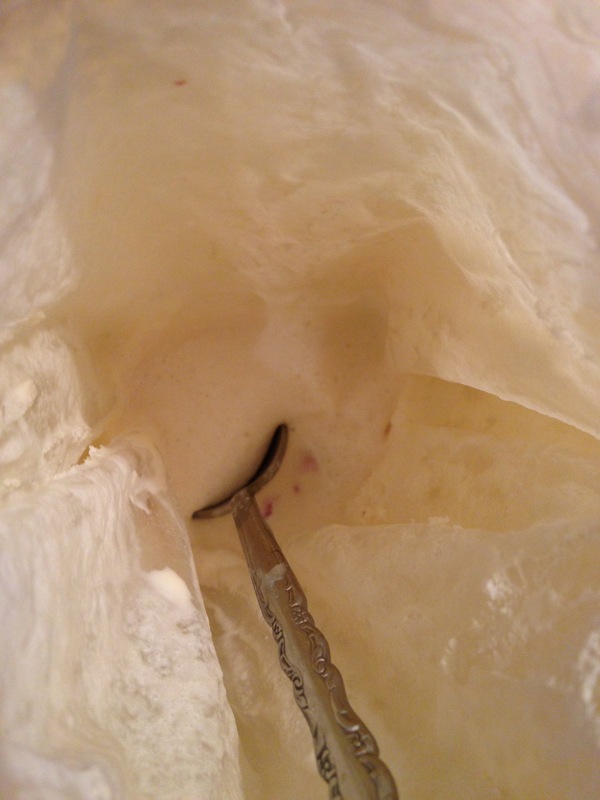 Eat out of the baggie with a spoon - quickly before it melts again! Ice cream is frozen cream with air pockets that make it light. The air is added as the cream is shaken. The temperature is reduced enough to freeze the cream by adding the salt. 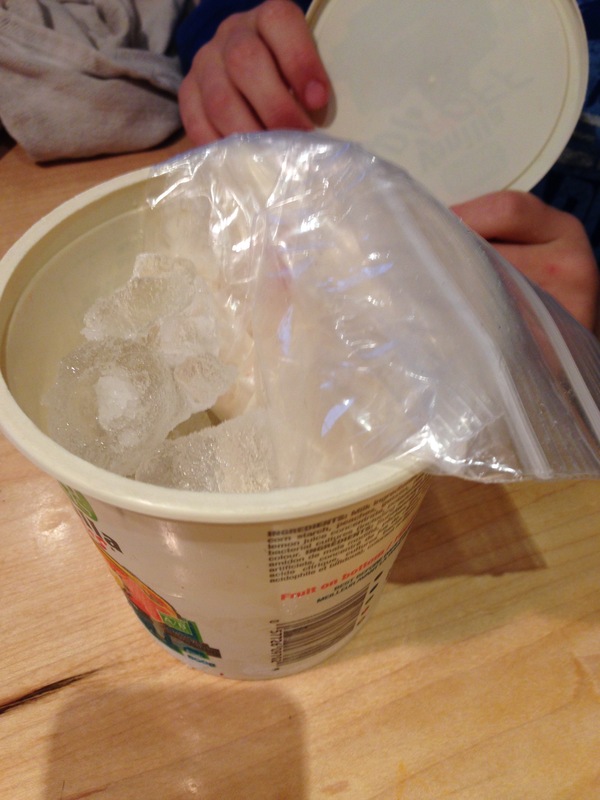 The salt lowers the freezing temperature of water, so that as the ice melts, liquid water lower than zero centigrade surrounds the cream, causing it to freeze. The ingredients include cream, which comes from cows, so this activity can be used in a unit on food from animals.